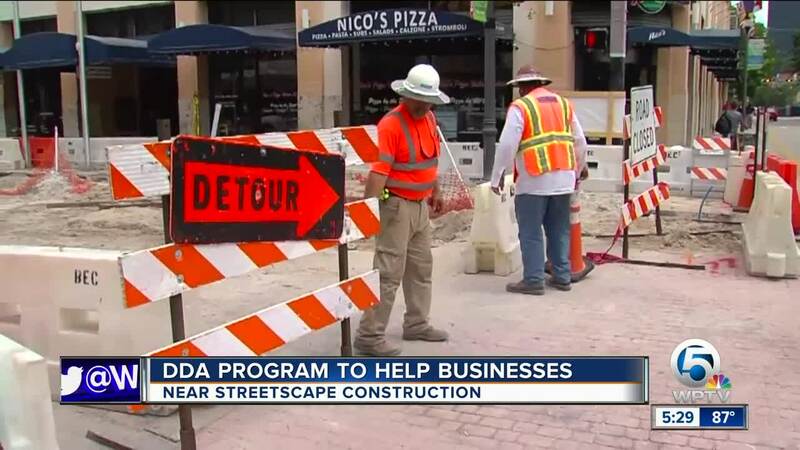 Summer months typically mean slower business for shops and restaurants in Downtown West Palm Beach, but now the Streetscape project is also deterring foot traffic on Clematis Street. The part under construction right now is the 300 block of Clematis Street. The Downtown Development Authority says it knows the construction is causing some trouble for businesses so it's started a program to give away swag bags worth 150 dollars, all you have to do is shop and dine in the construction zone. "Unfortunately our retail business has declined 60 percent since they started tearing up the street," said Sydney Jones, Assistant Manager and instructor at Fitness Hub on Clematis Street. Jones said class membership is still steady, but people are just walking into their store as much as they used. "There’s little to no foot traffic through the day, especially on weekdays and even weekends are even slower than they have been previously," added Jones. The studio is marking down items to bump sales. The Downtown Development Authority says they know times are challenging so they['re giving away a bag of goodies to every customer that gets 10 punches on their Dig Zone card. "On that card, we're asking you to spend 10 dollars at each participating business in the 300 block 10 times, so 100 dollars," said James. Then, you can claim your prize at the DDA office at 300 Clematis Street Suite 200. The swag bags contain a beach towel, a tumbler, an umbrella, and a surprise gift card. "I think it's great way for people to maybe visit a business that they may have not visited before," said Jessica Cummings, who owns a consignment shop on Olive Avenue. She's not directly impacted by the construction but says Clematis street businesses aren't the only ones seeing less foot traffic. "They literally will call me and do a drive-by," she said about customers dropping off items for consignment. "It's really just perception, it's due to this [construction] cause we still have the same amount of parking." Businesses say they're grateful for the DDA's help to boost business and can't wait to see the final more walkable streetscape. "When everything is done we’re hoping it's going to be a lot more enjoyable to walk this street and up and down Clematis," said Jones. The participating businesses on the 300 block will have a "Dig Zone" decal on the window. The streetscape construction projects are set to be completed in October, right in time for the start of the season. Once construction is done on the 300 blocks, other parts of Clematis will also be revamped.